What makes journeys on board luxury train experience extraordinaire? The journeys on board luxury trains are steps backwards in time to rediscover the art of elegant traveling; an era of decadence, romance and leisure. In this post we have tried to compile the list of the top 10 luxury trains in the world. And believe us when we say that its a difficult ask to choose just the 10 out of more than 25 luxury trains operating in various countries. After all we are talking about romance of the rail. Some of the greatest rail journeys out there. There are several luxury trains in operation around the world. Each one of them promises to take you on an enchanting voyage through fascinating landscapes and best destinations of the region. Venice Simplon Orient Express is a synonymous with a truly unique travel experience, which is complemented by the unsurpassed personal service. As you travel on the Venice Simplon Orient Express, you could experience stepping back in the 1920s. The unsurpassed quality of the décor is reflected through the exquisite glass panels and art deco marquetry. In the three dining-cars, the generous armchair seats are provided for the guests. Apart from this, the quality of service and food makes this luxury train stand distinguished. The cabins are provided with comfortable upper and lower beds, which are identical to the size of washbasin in a cupboard. To make more space in the cabin, the two can be connected. The train ensures an authentic experience of period travel and the same is reflected with the location of the lavatories, being at the end of the corridor, there are no showers. The bar car is a social hub of the train. The guests could enjoy and start a communication with other co-passengers. A pianist is also available for the entertainment of the guests. A small shop is also available on board from where the guests could buy tasteful souvenirs. In the restaurant car, refined French cuisine is served. The restaurant complies with the Michelin-star standard. To ensure a royal treatment, the meals are served with silverware and crystal glass and starched napery. Rovos Rail is a luxury train of Africa, which has combined the golden era of rail travel with the modern conveniences, creating an unforgettable and extravagant elegance of yesteryears. This experience is not to be missed as the journey beings in the magnificent Edwardian-styled departure room, to the unforgettable time spent onboard the opulent Rovos Rail. The luxury suites are air-conditioned and decorated with elegant wood paneling. En-suite facilities and Edwardian features also make Royal suites, Deluxe suites, and Pullman suites, ensure a lavish stay on board. Modern conveniences and comfort are available in the suites, along with fittings and facilities of the highest standard. However, the levels of luxury vary from suite to suite. The suites are also equipped with a personal safe for valuables and a writing area. Along with 24-hour room service, the guests on board are also facilitated with the facility of a mini bar filled with selected beverages. The dining car is designed with Victorian setting, with sparkling glass and silver, crisp linen and seamless service. The platter includes a wonderful range of food, including local delicacies with emphasizing on fresh and seasonal ingredients. The dinner is complemented by excellent South Africa wines. Apart from this, the lounge cars allow the guests on board to make the best use of the opportunity to relax and enjoy the spectacular scenery. The backside of the observation car also allows the visitors to enjoy the amazing experience of being outside, while the luxury train is moving. The Palace on Wheels - first Indian luxury train - is the winner of PATA Gold Award and voted as the World’s 4th Best Luxury Train. There are 14 salons that can accommodate upto 88 guests. The salons are named after the erstwhile princely states of India such as Alwar, Bikaner, Bharatpur, Bundi, Dungarpur, Dholpur, Jaipur, Jhalawar, Jaisalmer, Jodhpur, Kota, Kishangarh, Udaipur, and Sirohi. Each salon is tastefully designed with miniature paintings, furnishings, upholstery and mirror work, all reflecting a distinctive aura of royalty. There are 4 coupes (sleeping rooms) in each salon, with an attached toilet. To take care of the personal needs of the guests onboard, there is a salon captain valet and an attendant ‘Khidmatgar’ in every salon. Moreover, there is also a mini pantry, equipped properly to provide coffee/tea and snacks. There are two restaurants onboard, namely Maharaja Restaurant and Maharani Restaurant. These restaurants serve table d’hôte meals, which tickle the tastebuds of the guests. The authentic ambiance on the in-house bar and a selection of fine alcoholic and non-alcoholic beverages provides a better refreshment for the guests onboard. Further, to unwind and relax, sitting lounge is also available onboard the luxury train. Altogether, the Palace on Wheels offers a royal travel experience, alike the erstwhile royals of India. Here are the 5 things you need to know about Palace on Wheels. Price: Lean season (September and April) range from $410 per person per night (Triple Sharing Cabin) to $600 for single-cabin occupancy; high-season (October to March) range from $540 to $800. If you want to experience the warm Canadian hospitality first hand on train travel, Rocky Mountaineer is the best answer to it. The guests could choose from the routes such as GoldLeaf Service, SilverLeaf Service, or RedLeaf Service and Whistler. This luxury train travel has also been awarded for the Seventh time for “World’s Leading Travel Experience by Train” by World Travel Awards. Along with this, Travel + Leisure has also awarded this train as one of the world's "Best Life-Changing Trips". In 2013, Rocky Mountaineer has also introduced a new route, Coastal Passage, which connects Seattle to the Canadian Rockies. This could be made as an extension to any rail journey of two-day or more. The GoldLeaf Service is synonymous with luxury and comfort at par. Features such as deluxe accommodation, exclusive dining room, gourmet hot meals and complimentary beverages and snacks mark this service as the most popular. Two level, glass domed coach with full-length windows are also available to ensure a better view of the surroundings while the train is moving. With SilverLeaf Service, the guests could enjoy the scenery through the windows of the custom-designed, single level glass dome coach. The guests can enjoy sumptuous breakfast and lunch at their respective seat. Along with this, complimentary snacks and non-alcoholic beverages are also served. The guests are also provided with the facility of overnight hotel accommodation. In RedLeaf Service, the guests enjoy the service and commentary by the Host, along with delicious meals, being served at their respective seat. To enjoy the scenery, large picture windows are provided. Along with relaxing on the roomy, reclining seats, the guests could savor upon the complementary snacks and non-alcoholic beverages, and a glass of wine or beer with lunch. The Whistler Service is an unforgettable rail experience with large picture windows and legendary service in classic rail cars. Along with the chilled breakfast or afternoon snack, the guests can also enjoy the complimentary non-alcoholic beverages. The hosts offer storytelling and other services, along with access to the Heritage Observation Car. Where: Vancouver to Calgary, Vancouver and Jasper, Whistler to Jasper, Seattle to Jasper, Vancouver to Whistler. Price: August range from $2,827 for two people traveling in Redleaf service, with regular coach seats, to $5,552 in the full-length-window dome car for double occupancy. Summer fares start at about $100 CAD (about $96), overnight accommodations excluded. Maharajas Express has been voted as "The World's Leading Luxury Train" at The World Travel Awards, 2012. Along with this, the train was also listed amongst the World's Top 25 Trains, 2011, by The Society of International Railway Travelers. The onboard accommodation, dining facilities, service, and off-train excursion program are some of the considered parameters. Maharajas Express also bagged the first runner up award at Conde Nast Travelers Reader Choice Travel Award in the Specialist Train Operators Category in 2011. There are 14 guest carriages, which accommodate 88 guests on board. The carriages are categorized as 20 Deluxe Cabins, 18 Junior Suites, 4 Suites and a lavish Presidential Suite. All these are praised for offering stylish living similar to 5 star accommodation. Check out what's in the names of Maharajas' Express guest carriages. 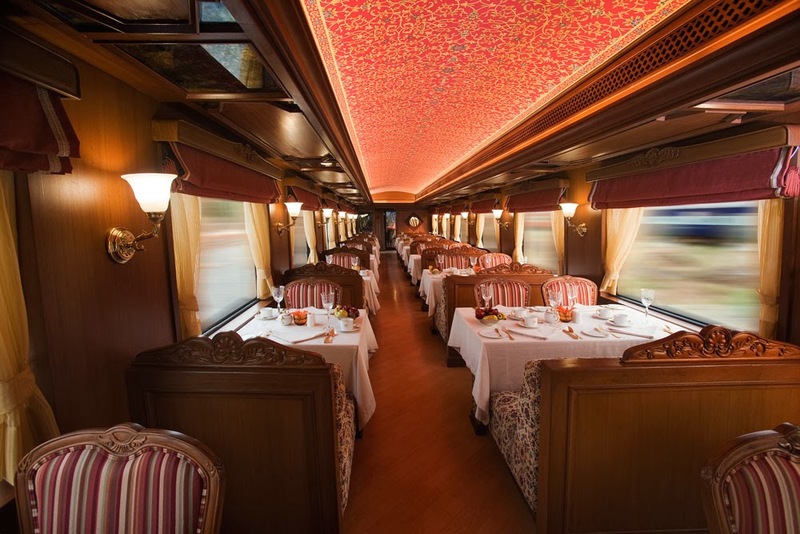 The train also features two restaurants to tickle the tastebuds of the guests onboard. “Mayur Mahal” and “Rang Mahal” are the two restaurants that leave the guests spellbound with its amazing hand painted fresco ceiling. At any given time, the restaurants can accommodate up to 42 guests. Apart from restaurants, the luxury travel carriage also features two bars for the guests who enjoy drinking over a friendly conversation. 'The Rajah Club' is a lounge bar and 'Safari Bar' is a thematic bar, both designed to provide relaxed and comfortable sitting arrangement along with complementing the fine range of spirits and wines. 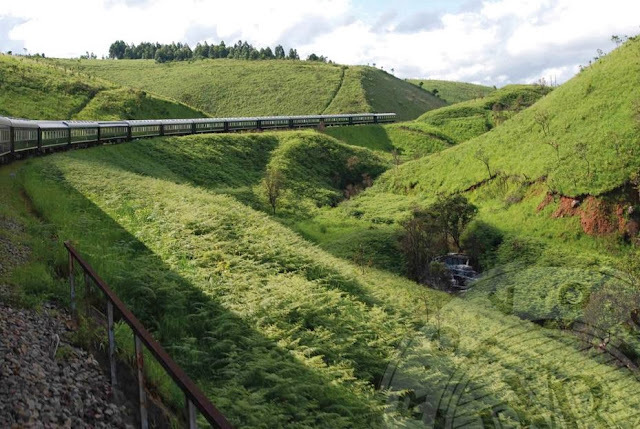 The Eastern and Oriental Express is the praiseworthy luxury train, which takes its guests across beautiful landscapes. The sojourn of 1200 miles through Thailand, Malaysia and Laos includes mountains, fascinating towns, forests, and golden temples, which create a wealthy tapestry of life. The train has 6 different journeys which include Bangkok-Singapore (4 Days/3 Nights), Singapore - Bangkok (3 Days/2 Nights), Epic Thailand (7 Days/6 Nights), Fables of the Hills (7 Days/6 Nights), Legends of the Peninsula (7 Days/6 Nights), and New Year Celebration (5 Days/4 Nights). The well-appointed compartments are categorized as Pullman, State and Presidential Cabins. To meet the specific requirements of the guests onboard, the cabins are equipped with all ultramodern facilities and services. The interiors also reflect the unspoilt element of luxury with walls with cherry wood and elm burr paneled, beautified with decorative intricate inlays and marquetry. The beds could be folded for comfortable seating during the day. Breakfast and afternoon tea are served in the respective compartments of the guests. For lunch and dinner onboard, there are two restaurant cars featured on the train. The restaurants are lavishly decorated using elm and rosewood paneling. The chefs, appointed onboard, are praised for their skill to create a tantalizing range of Eastern and European delicacies. There also is the Observation car, where the guests could enjoy the beautiful scenery complemented by coffee or tea. Golden Eagle Trans Siberian Express is praised for being the greatest rail journey of the world. This luxury train connects east and west from Moscow over the Urals. The journey makes the guests witness the magnificent and endless steppe and the shore of the largest freshwater lake of the world, along the sides. To meet the specific preferences of the guests, the accommodation compartments are categorized as Imperial Suites, Imperial Suites Stats, Gold Class, and Silver Class. There are two restaurants, which have the capacity to accommodate 64 guests. The “Gold” restaurant car is beautified with brass surfeit, indirect elaborated lighting, overhead glowing lights and gleaming wood. The “White” restaurant car is decorated with the shades of cream and white. Gold medallions, intricate carvings and mirrors are used to highlight the interiors. The maitre d' and executive chef onboard also ensure for excellent service and food. 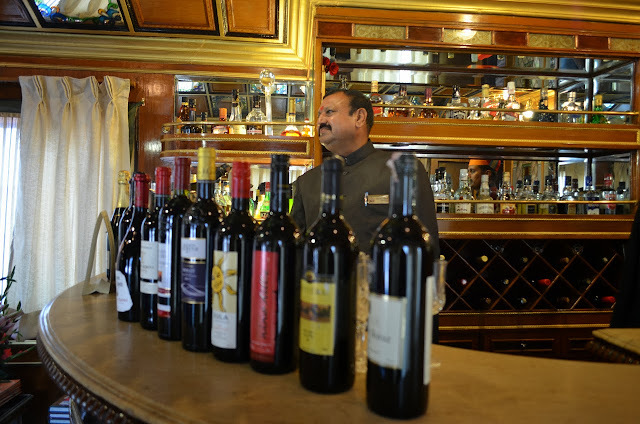 The luxury train also features Ornate Bar Car, which is considered as a social center. For the entertainment of the guests, there is a piano and pianist. For the guests in Gold and Imperial class accommodation, there are bar drinks included as a standard bar list and a premium bar list, respectively. For the guests in Silver Class, the drinks are additional. Where: Moscow, Kazan, Yekaterinburg, Novosibirsk, Irkutsk, Lake Baikal, Ulan Ude, Ulaan Baatar, Vladivostok, Khabarovsk. Royal Scotsman luxury train travel is praised for taking its guests to the heart of the highlands. The landscapes of pine-clad mountains and their reflection in mirror-still lochs serve a breathtaking view for the guests on board. With 36 guests in total, the train assures of the most personal travel experience. For the accommodation of the guests on board, there are 14 twin, 2 double and 4 single State Cabins available. Each cabin is adorned with rich marquetry. The cabins are also equipped with amenities such as a private bathroom with shower, toilet and washbasin, high-quality toiletries, constant hot water, and fresh towels daily. Apart from this, the cabins are also equipped with all basic and modern amenities to ensure a luxurious train travel experience. The luxury train also features an Observation Car where the guests could enjoy the sights of the spectacular Highlands scenery. As the train takes you through the past castles, glens and villages, enjoy the sight by settling gradually on comfortable sofas and armchairs. A veranda is also available for the guests wanting to enjoy open-air views. Thereafter, dining on board is always a major highlight. Sumptuous meals, throughout the journey, are served in the mahogany-panelled Restaurant Cars. There are large tables of six or eight are arranged to allow the guests to enjoy meal in groups of four or more. The guests could also savor a range of fine wines, malt whiskeys and liqueurs available in the extensive cellar on board. Where: London, Edinburgh, Keith, Dundee, Glasgow, Perth, Cambridge, York, Ardlui, Scarborough, Cambridge, Oxford, Bath, Chester. 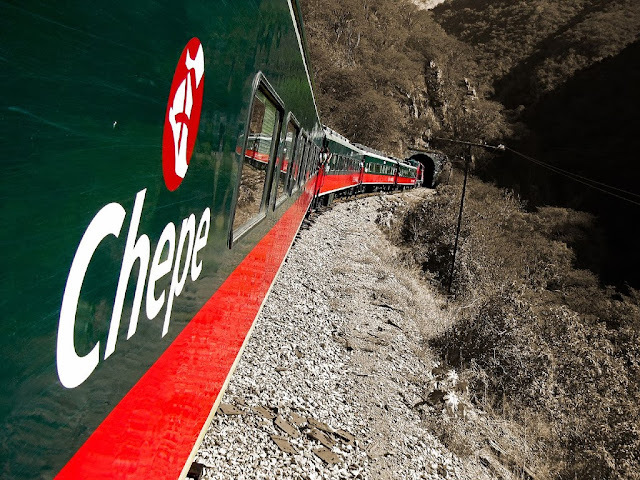 The magnificent railroad journey of the Chepe, on the most spectacular route of the world, takes its guests across the natural landscapes. Along with this, the guests also get the opportunity to get close to the Raramuri culture. Raramuri culture is the most ancient and best preserved within Mexico. In 1961, after 11 years of planning and construction, the Chepe began its journey. About 405 mile route (twice daily) is traveled by the train, crossing the Tarahumara Sierra and other major tourist attractions. The Chepe has 2 classes of service, namely, Primera Express (First Class) and Clase Económica (Economy Class). The Primera Express train departs at 6:00 am from Los Mochis, whereas the Clase Económica train departs 1 hour later. The major difference between the two classes is the spacing of the seats and comfort. Along with this, the Clase Económica train makes extra stops along the route upon the request of the passengers on board. There are 2 or 3 passenger cars (64 seats each) in the Primera Express train. A dining car with meals and bar service is also available for the guests. On the other hand, Clase Económica train has 3 or 4 passenger cars (68 seats each), and a “snack car” to offer fast food to the guests. Air conditioning and heating system are available in both the classes. Additionally, ecological toilets and reclining seats are also featured in both. Further, to make the train travel more enjoyable and comfortable for the guests, a porter is available to attend to the guests on board. The Ghan, synonymous with outback Australia, is an engineering marvel. This luxury train travels through Adelaide all the way to the Darwin. 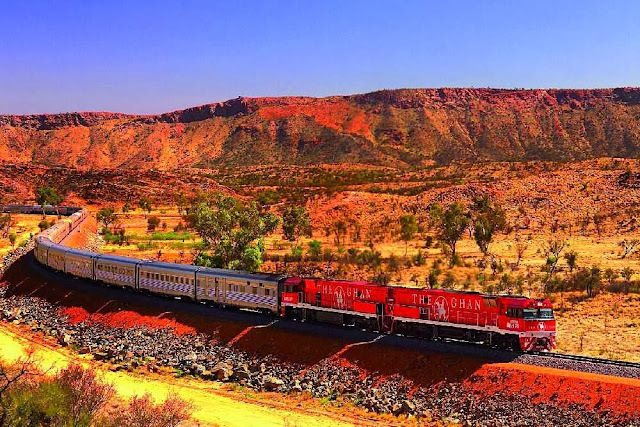 The rail line is 2,979 km long and the guests onboard enjoy the journey through the soul and the heart of the mysterious interior of Australia. In order to cater the best travel experience, the classes of service is categories as Platinum, Gold and Red. The Platinum Service, being the highest class of service, available on The Ghan let the passengers enjoy private cabins with en suite and full amenities. Along with this, complimentary continental breakfast, on-call Cabin Steward Service, oversized windows for panoramic views, and in-cabin menu is also available in Platinum service. For upscale dining, the Queen Adelaide Restaurant Car is also available, which offers 2 meal sittings per evening. The Gold Service assures stylish sleeper accommodation onboard. The guests onboard enjoy either a larger Superior Cabin with a 3/4-size double bed or Twin Berth Sleeper Cabin. The cost of fare also includes meals. Passengers in the Superior Cabin enjoy a roomy double-sized cabin featuring an in-room mini bar, and the cost of fare includes an access to the Restaurant car with meals. The guests also enjoy optional room service meals. The guests in the Twin Berth Sleeper also have the access to the Restaurant Car, complimentary coffee and tea, and also may buy alcoholic beverages on board. With Red Service, the guests have the option to choose to stay in either a convertible Day/Nighter Seat or Sleeper Cabin. The Day/Nighter Seat includes recliner lounge-style chairs with individual reading light. The guests also have the access to the Red Service Diner. Pillows and blankets are available for purchase. In the Sleeper Cabins, there are twin share day berths, which could be converted into twin sleeping berths at night. The cabins also feature wash basin facilities and amenities, along with access to the Red Service Diner. For the Red Service passengers, full shower facilities are available at the each carriage’s end. Interested in more names? Check out our article on Top 20 Luxury Train Journeys in the World. Updated by Neelam Talreja Nov 2013.